Lately, I've really been enjoying Australis as a brand and trying out some of their new products. Two of my favourites at the moment, are the Blush BFF's duo and the Velourlips Matte Lip Cream. 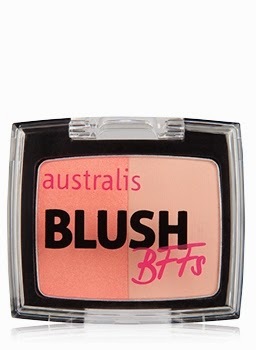 Australis Blush BFF's in Shop & Goss. The Blush BFF's duo I purchased, is in the shade Shop & Goss and I love it as an every day blush. The thing I love the most about this blush, is how blend-able it is. I tend to blend the two colours together, straight onto the skin and it all blends in easily and naturally. The colour is also easy to build for a more dramatic effect. I really like these particular shades on my fair skin, but there are three other shades also available in this range. At $12.95 (AU) from Priceline, I think these are a really affordable little duo! ﻿﻿The one product everyone seems to be raving about at the moment, is the Velourlips range. I purchased the shade Rio-D and I LOVE this bright, orange colour! One thing to remember about this range is that they are lip creams, not glosses - the consistency of the formula is very thick, almost like a lipstick in a bottle. The colours are intense and personally I find that just the tiniest amount is plenty. I apply a couple of small dabs on the bottom lip and then blend it thoroughly all over. Of course, it depends on how bold you want your colour to be - if you want a more intense look, it's very easy to build up to a super bright, strong shade! The only thing I don't like about this product, is that it seems to get a little cakey throughout the day and I find I need to blend it out with a little bit of lip balm. But for $9.95 (AU), I think this is a great quality product and I would definitely consider purchasing some of the other shades to try. As always, I'd love to hear your opinions on these products if you have tried them for yourself, so please do comment below and let me know! Disclaimer: This post is based solely on my own, personal opinions of these products. I have not been paid, or reimbursed in any way for this post by any of the companies, brands or stores mentioned.